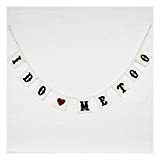 This lovely ‘I Do, Me Too’ bunting features cream pennants with retro style black lettering and a red heart. Features 9 rectangle flags, each measuring approx 10 x 12.5cm. Made out of a combination of cotton & linen, the total length of the bunting is approx 175cm. A perfect decoration for a wedding venue, bridal suite or to welcome the happy couple home from honeymoon, which can be kept long after the celebrations are over! (Please note fabrics & colours may vary slightly from those pictured). Features 9 rectangle flags, each measuring approx 10 x 12.5cm. Made out of a combination of cotton & linen, the total length of the bunting is approx 175cm.